Rammed Earth Works and Watershed Materials bring the practice of resource conservation to a new level. Working for the second time with Hsu Design on a groundbreaking concept, this hybrid structure combines rammed earth block walls, a full perimeter clerestory, and a prefabricated roof. It’s now underway in the City of Napa. Such a model of construction efficiency shows great promise for advancing strategies for deep green building. The Watershed One house is the fourth iteration of a building concept we’ve been refining for a decade. Fundamentally it is repeating masonry modules connected via transparent spaces. It began with the Hana project followed by Terra’s House and then Jack and Juliet’s house. The advantage to this modular design approach is that it simplifies on site construction and lends itself to pre-fabricated roofing systems. Repeating formwork and repeating dimensions makes layout less complex, installation more efficient, and shorter construction time. Creative design and thoughtful detailing prevent modularity from becoming mundane. Unlike the first three versions, which were built with rammed earth, the walls for the Watershed house will be constructed using our new rammed earth blocks. We call them Earth Masonry Units (EMU’s) because of their similarity to concrete masonry units (CMU’s) which have been industry standards for nearly a hundred years. We outfitted a block factory in Napa, adjacent to the quarry from which we obtain the bulk of our raw materials (all rock screening by-products), and are now in the manufacturing business. We’re building Watershed One house to showcase the new blocks and to help us refine a range of details that will allow us and others to build efficiently and beautifully with EMU’s. 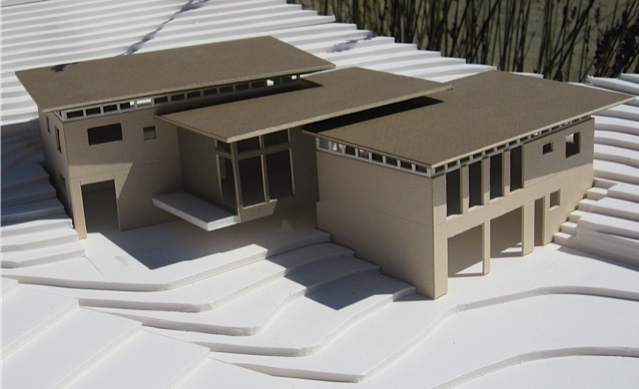 The architectural concept is straightforward, as you can see in the photograph of the model. Two-story volumes built of blocks flank a one-story connector that floats above the site’s natural drainage - the watershed. Perimeter Vierendeel trusses with operable clerestory windows support the gently sloping roof planes. Broad overhangs shade the walls from summer heat gain. Radiant heated interior slab floors stiffen the wall frame and contribute to the thermal flywheel that anchors the energy efficiency. The exciting parts about this project for me are: cutting benches into the hillside of an old quarry to extract valuable resources from our own watershed; building the first ever walls with the rammed earth blocks; crane setting the roof panels and the steel trusses we built at the shop (hopefully they fit); putting it all together into a home that rises out of and then reconnects seamlessly to its site; and finally, confirming that we can do it efficiently and affordably. I’m not sure how we’ll do on the efficient and affordable goals, but I am sure that it will be interesting to watch.